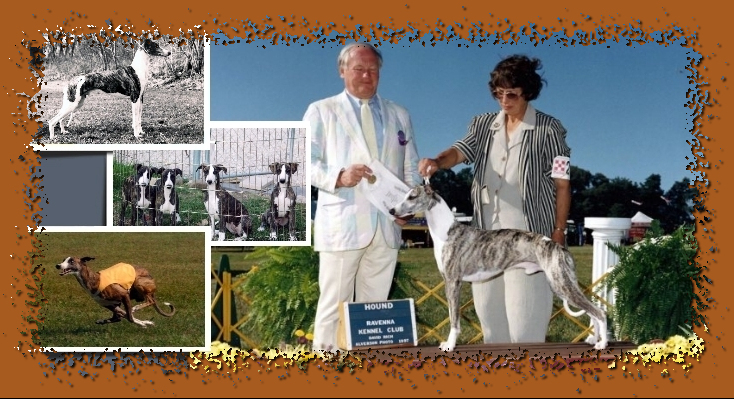 Plumcreek Whippets started in 1966 when we met Barbara and Josephine Steinberg of Traymatt Kennels in of all places, a gas station! They pulled up in a van loaded with Whippets, and the rest is history! Our first Whippet, Frista, endeared us to this remarkable breed. Our early dogs and foundation for our breeding program came from the Traymatt whippets bred to CH Marial's Phoenix, CH Laguna Leisure, and CH Misty Moor's Chalmondoley. Since that time, the Plumcreek Whippets have established a reputation of being sound, quality, and powerful Whippets both in and out of the show ring. They have enjoyed much success in the show ring, with all breed Best in Show winners, Specialty Best In Show Winners, and an American Whippet Club Top Twenty winner, either from our home or through the sons and daughters of our top producing males owned by other Whippet breeders. As Whippets are Sighthounds, they are also fierce runners who love to "chase the bunny" in lure coursing and racing, fun events where the dogs can chase a simulated lure and run like the wind. Obedience, agility, even flyball, Whippets can do it all! Most of all, the Plumcreek Whippets love to be part of someone's family, and are most at home in someone's bed, curled up with the people they love.